I am immersed in the culture here, specifically the Toba Batak culture. For the Batak people, marriage is very important. Every weekend and sometimes even during the week, there are wedding parties in the Church that is next to the deaconess school. A family will go to great expense to have the party. All day there is traditional music, dancing, and customs. Below you see a photo of a party. 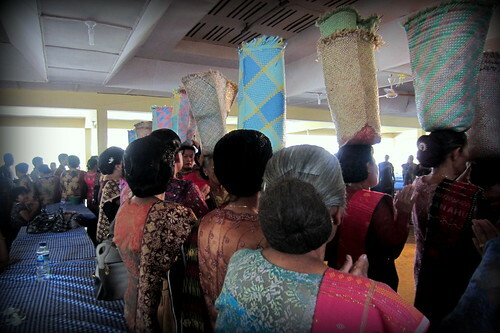 The women are in their kebaya (dress) and wearing the ulos (blanket) over their shoulder. In the back, women carry bags of rice on their head. They are dancing to traditional music, rhythmic tunes of flute, guitar, saxophone, and drums. Although this image depicts something similar to what you would see at a wedding, this party actually isn’t for a wedding. As it was explained to me, the couple already got married in Jakarta. The groom is Toba Batak and the woman is Javanese (Jakarta is on the island of Java, where the Javanese are from). In Javanese culture there are no family names. Therefore, Javanese people go by only one name. For the Batak people, however, the family name is very important. So, here you see a custom that invites the bride into Batak family and culture. First, they had a ceremony in the church, then the party, as you see above.